Ardvasar is a Clachan on the Sleat peninsula of the Isle of Skye, nestled down in the South of the island and rubbing shoulders with Armadale. It is well connected to the mainland via a ferry service from Armadale to Mallaig, which provides one of the most scenic drives in to Fort William. At various points in its history, the property has been both shop and home to its inhabitants, latterly being used exclusively as a shop on the ground floor, with storage to the first floor. Sleat Historical Society states that the shop was run by the Kennedy family, ‘for almost a century, from the end of the 19th Century until 1978’, when the previous then ran it for a further 40 years, up until 2017 when the client purchased it. The store has been an important provider to the local community over its lifetime and losing it would clearly impact negatively on the community however as part it’s closing, all fittings and consumables were passed to the Sleat Community, Trust-owned Filling Station at Armadale. This ensured a convenience store and Post Office would always be provided to the local community . 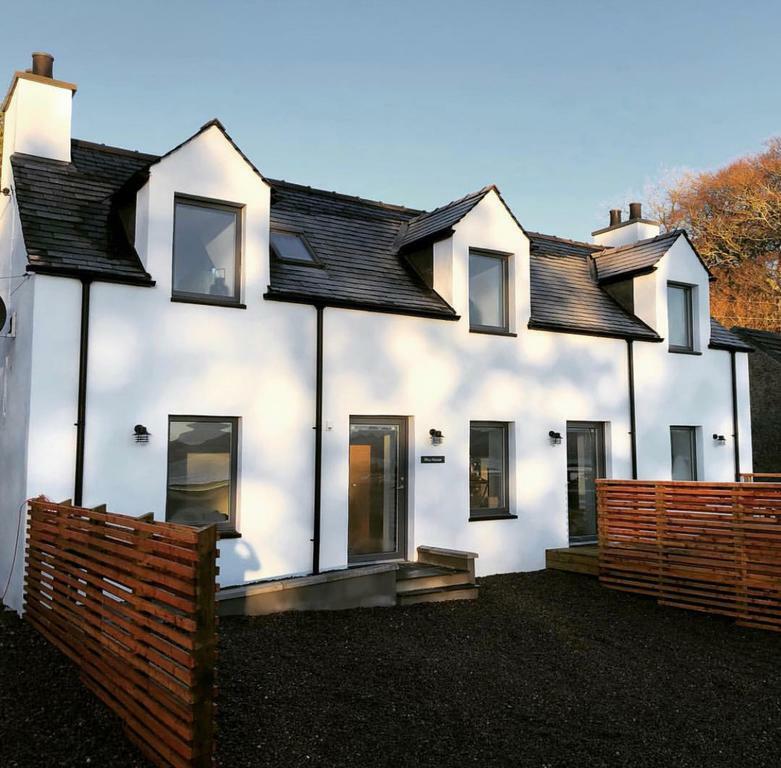 The client approached D² architect to convert the property into a new home by providing a detailed design for construction and the submission of applications for Planning and Building Warrant to Highland Council. 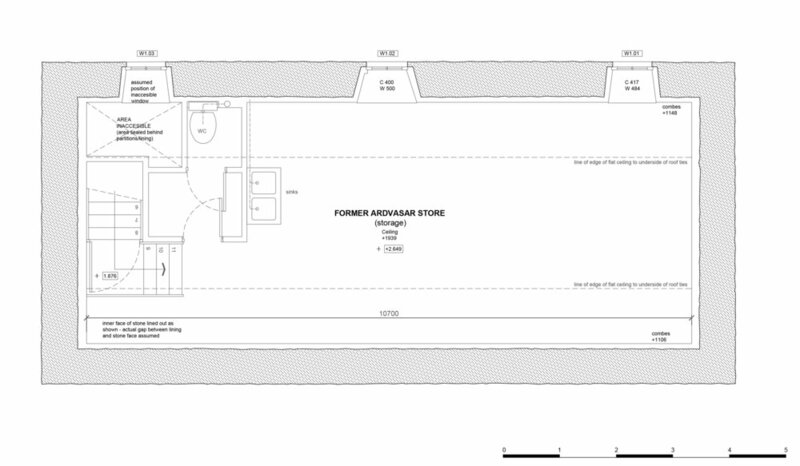 This would see the traditional stone building taken care of, with it’s refurbishment and modernisation contributing to the street-scape of Ardvasar. The existing principle elevation of the property displayed curiously small windows to the first floor store, sitting just under the gutter. Historic photographs reveal that these windows are the remnants of traditional pitched roof dormers removed at some point - why they were removed is unknown but it may have been due to weathering and deterioration, especially being so close to the coast. The chimneys had been removed and the fireplaces blocked internally, resulting in mould appearing on the internal linings due to lack of ventilation and trapped damp. The property was constructed with coursed, random rubble, split face natural stone, painted to the front and side, and rendered to the rear, most likely in response to wind driven rain from the South West. The windows to the principle elevation were modern uPVC replacements in white with doors to match and the roof, natural slate with lead flashings and uPVC rainwater gutters. 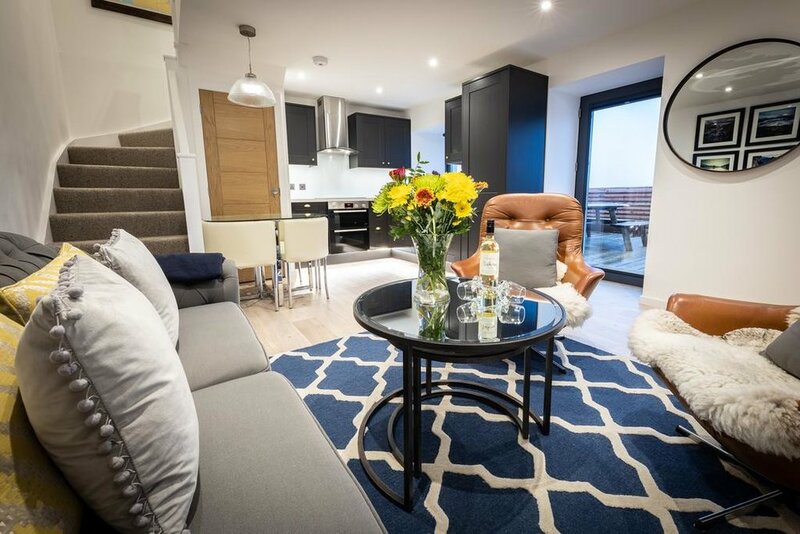 There was an initial desire to return the property to it’s original form but to acknowledge some modern materials to provide greater comfort and lower maintenance. The original dormers were to be reinstated with an additional velux window for extra light. A new white render would be applied to stone and aluminium windows fitted to replace the uPVC. The use of aluminium can be controversial with local planning officers, however it was deemed that the property was not of historical significance and they were approved without fuss. Interestingly, this project was carried out at the same time as the Pier House, where aluminium windows were not supported by the planning officer. New slates and a roofing membrane were fitted to ensure no problems would occur with leaky roofs. 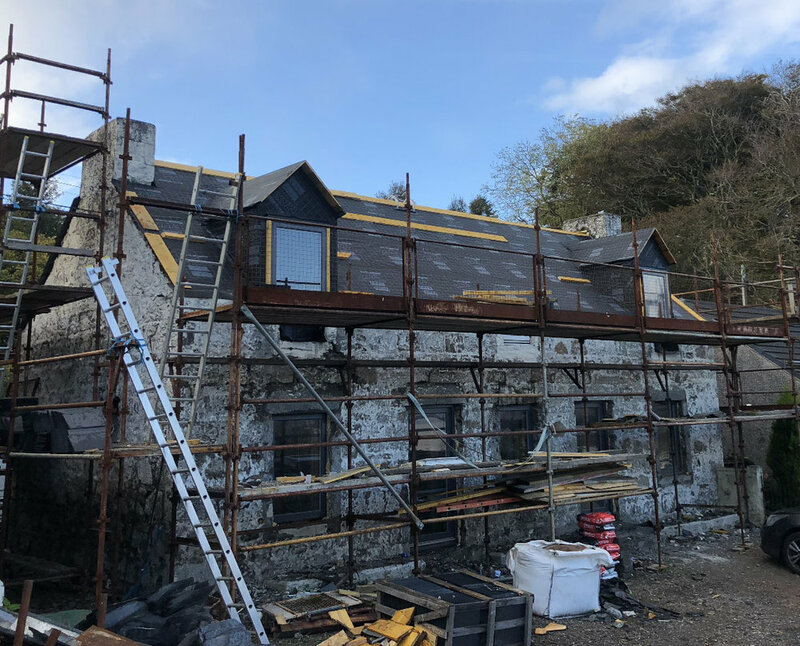 The client, a local of Sleat, carried out the majority of the work to a very high standard and it was once again a pleasure to work on a project with a rich history and knowledgeable client. Historic photographs help gain an understanding of how changes have occurred in the past. Here, we can clearly see the original dormers and how they looked. The planning application was adjusted to reflect comments from the planning officer - initial designs included a horizontal and vertical zinc clad window which were rejected by the planning officer as being detrimental to the style and heritage of the building. It is often a shame that modern or contemporary designs are discounted from traditional buildings. 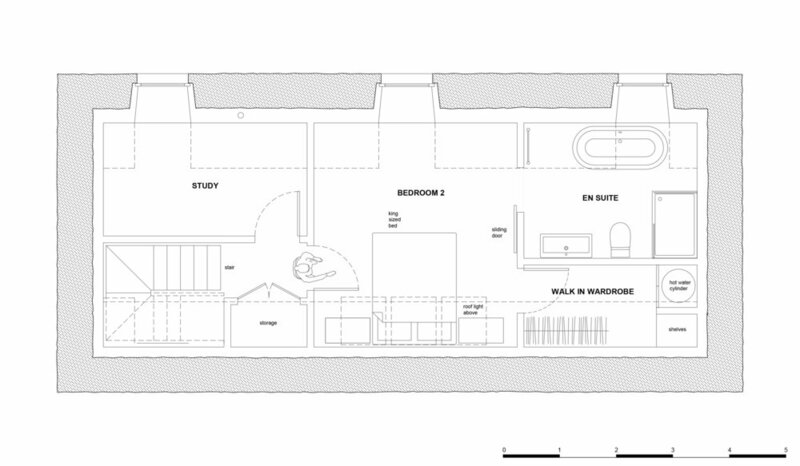 Often a prolonged planning process can result and many clients are keen to simply push forwards with their project. Design can be compromised to smooth the process. Scaffolding up and works well underway in forming the new dormers and replacing the slate roof. 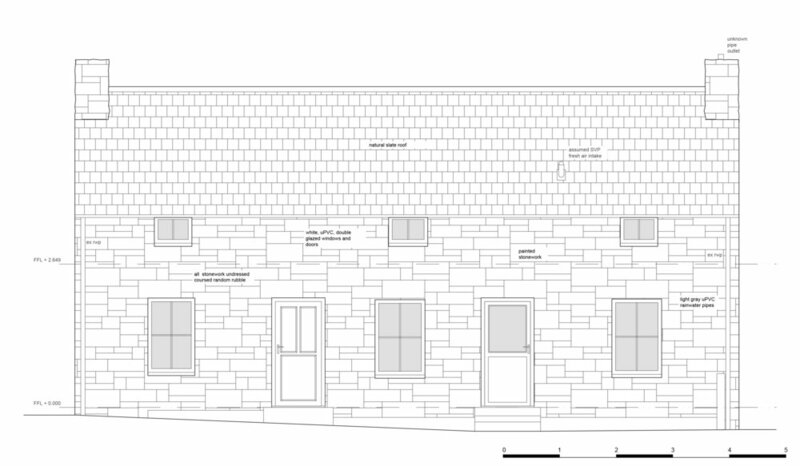 Note that the hipped end dormer shown in the drawing was adjusted on site to form a regular gable end dormer. This helped to simplify the detailing and ease construction.